Here are a few ideas and hints about how to revamp a 10 year old boy's bedroom to create a soccer-themed look. 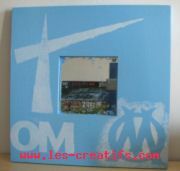 As our soccer fan is a supporter of the French club Olympique de Marseille (OM), that helps in terms of decorating, as the club's colors are pleasant shades of light blue, going towards turquoise and a contrasting white and sometimes a deeper shade of blue. Before White walls and baseboards, the touch of color is achieved through a gorgeous wide decorative border. The furniture is in light-colored wood, some of it in unfinished wood. Take the bed down, place all of the furntiure into the center of the room, and the room makeover can start with the thankless task of removing the existing decorative border with the help of a wet sponge and a scraper, followed by a little light sandpapering. Firstly, go for natural paints (with linseed oil binder) to avoid introducing any toxic substances into the child's bedroom. To obtain a very specific color, such as ''OM blue", a very dark turquoise was mixed with a sky blue color. 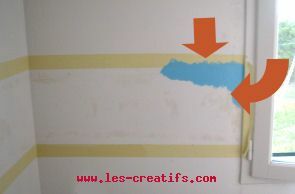 The decorative border is painted using a wide paintbrush, painting from the outer edge of the border towards the center so as to avoid splashes beyond the masking tape area. After the paint has dried, a second layer of paint is necessary. 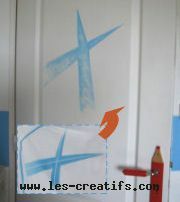 The cross is painted using a stencil brush (a round brush with a flat end which can be used with a stencil). Like with a stencil, you first have to dab the brush on a cloth, before applying paint, dabbing it on inside the area marked off by the masking tape. Above the bed, here's a computer-designed picture (with their first name on the ball) which is printed onto thick photo quality printer paper, then carefully cut out. 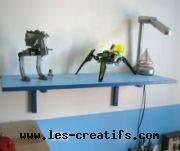 This shelf unit in unfinished wood was made some time ago by our young craftsman and his dad. 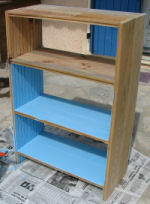 It too gets a makeover in two different colors, the edges of the shelves being painted in a deeper shade of blue. Once they have seen their partially revamped bedroom, we can start the next stage with our young artist the "artistic" stage, using a stencil. You'll love this design so much that next up to be decorated with the stencil will be the mirror, picture frames and even the shelf unit! The stencils consist of images (logos...) that are printed out then reproduced on photo quality printer paper (as this paper is fairly water-resistant as well as easy to cut, it's perfect for making stencils which will be used ten or more times). Be careful when using the stencil to make 'hollowed-out' letters (for example, the "O" of "OM"), you have to keep the part that you hollowed-out and set it in position along with the stencil, right in the center of the "O" each time you use the stencil... We've decided to use 2 'reverse effect' stencils for a different touch. 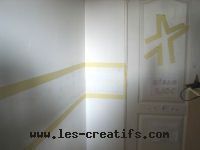 As soon as the stencil has been carefully cut out, its back is covered in non-permanent spray adhesive. All you have to do now is position the stencil (at various points on the decorative border to begin with, then upon the items to be decorated) and dab the area inside the stencil with a paintbrush from which most of the excess paint has been cleaned off. Here are a few more ideas... a net attached to the wall from which to hang photographs or cuttings (these items are held fast by wooden clothespins decorated with a football design), letters in wood to be glued to the wardrobe, which now becomes the "visitors' locker"... Where can you find materials and other decorating ideas? here are some furniture and accessories in painted wood in matching themes from the store"L'art du bois (Wood art)"
Would you like to share your photographs of a revamped room or a newly-decorated kids' bedroom? Share your big project with us !